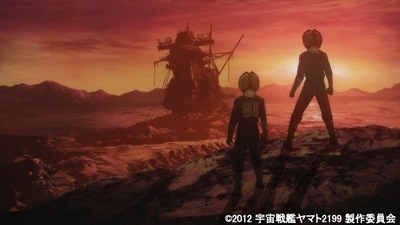 The Good, the Bad, and Godzilla 続・夕陽の呉爾羅: SPACE BATTLESHIP YAMATO: 2199 (2012) Coming to Japanese BD & DVD on May 25th! Coming to Japanese BD & DVD on May 25th! 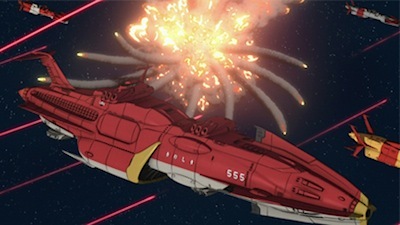 As I first wrote back in November, the long-anticipated return to the hugely popular SPACE BATTLESHIP YAMATO series, known in the US as STAR BLAZERS, was building steam with an animated feature follow-up to 1983’s FINAL YAMATO, entitled SPACE BATTLESHIP YAMATO: RESURRECTION (2009), and the big-budget live action film by Takeshi Yamazaki, SPACE BATTLESHIP YAMATO (2010), and then came the exciting, official word of a new, 26-episode half-hour series, SPACE BATTLESHIP YAMATO: 2199, a remake of the groundbreaking 1974 production. It was also announced that YAMATO: 2199, which had been in various stages of development for several years, would be helmed by Yutaka Izubuchi (RahXephon). A fellow, unabashed Yamato fan, Hideaki Anno (Evangelion) had originally been attached as chief director, but would still end up contributing to the series by designing the storyboards for the opening credits sequence, which were then finalized by Izubuchi. Admiral Okita's Battleship, Kirishima, at the Battle of Pluto! Word got even better when it was announced that Izubuchi and the producers, including the adopted son of the late Yamato creator, Yoshinobu Nishizaki, were sticking close, if not exactly, to the design parameters of the original YAMATO, by hiring Junichiro Tamamori (Scarecrowman) as lead Mechanical Designer, who came to their attention through his website, "Yamato Mechanics" (and several notable Yamato fanzines). 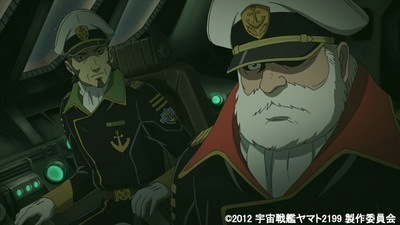 While the look of YAMATO: 2199 was rooted firmly in the past, the character designs would be completely updated for modern sensibilities, while still remaining familiar to longtime fans, under the pen of Nobuteru Yuuki (Space Pirate Captain Herlock: The Endless Odyssey). Likewise, YAMATO: 2199 would benefit from the latest animation techniques and 3DCG rendering under the auspices of Xebec (Lagrange: The Flower of Rin-ne) and A.I.C. (Mankind Has Declined). I feel that if these techniques were available in 1974, that they would have been fully implemented at the time, in making the original series. The Kirishima's captain holds fast, as Okita makes a difficult decision! Then came the announcement of music composer, and since the late Hiroshi Miyagawa's indelible scores would be a hard act to follow, they simply hired his son, Akira Miyagawa (Shin Mazinger), to rearrange his father's compositions, and pen his own. And when you didn't think it could get any better, legendary vocalist, Isao Sasaki, was also tapped to record a new version of the theme song he made famous 38 years ago, while Aira Yuki (True Tears) is performing the ending theme song, "In the Eternal Light of the Stars". But, despite the veritable all-star line-up of talent, promising that YAMATO: 2199 would be a sure-fire hit, the networks weren't biting when it was originally pitched (according to some industry sources). Whether this is rumor or fact, in this new digital age, television is not the end-all-be-all, and it was decided to cut together the episodes into a series of seven feature films, screened in select theaters through Shochiku (Japan's oldest motion picture company), beginning on April 7th with "The Long Journey" (Episodes 1 & 2) and followed by "Desperate Battle in the Heliosphere" (3 through 6) on June 30th. Kodai & Shima are about to set out on a pivotal mission! 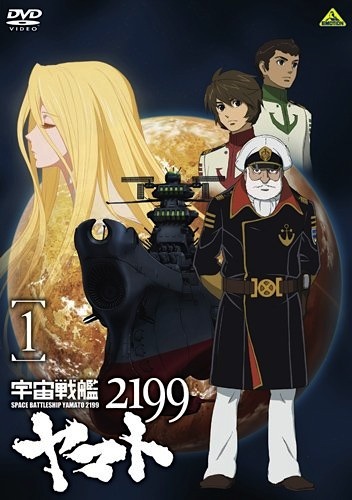 In addition to the theatrical screenings, the uncut episodic versions of YAMATO: 2199 are to be issued on DVD & Blu-ray (BD), starting with Volume 1 on May 25th. This initial volume will contain the first two episodes of the series, "The Messenger of Iscandar" and "We're Off Into the Sea of Stars", both written by Izubuchi and directed by Akira Enomoto (Yu Yu Hakusho: Ghost Files). Special features will include a special outer slipcase featuring stunning art by famed illustrator Naoyuki Kato (with the case sleeve featuring Yuki's art, seen above), a facsimile of Anno and Izubuchi's Storyboards for the Opening Title sequence, an insert booklet, the Clean Opening sequence (Acapella Version), and an Audio Commentary for Episode 1, featuring writer-director Izubuchi and voice actors Daisuke Ono (Susumu Kodai) and Houko Kuwashima (Yuki Mori). Subsequent volumes in the series, from Bandai Visual, will feature four episodes per disc. Now available for pre-order on Amazon Japan (with an April 15th cut-off), the BD for Volume 1 has already placed #15 on their Best Seller's list. Kodai & Shima discover the wreck of the Battleship Yamato! Meanwhile, for those who can't wait that long, advance copies of the BD for Volume 1, sold exclusively at theaters screening "The Long Journey", will contain a special bonus booklet of Izubuchi's complete storyboards for the "The Messenger of Iscandar" (sporting a cover featuring Sasha of Iscandar, illustrated by Yuuki). The movies will also be streamed simultaneously, as Video On Demand, on Hikari TV, part of the NTT Plala network, which will also preview "The Long Journey" for six days, starting on March 23rd. Yes, "Yamato Fever" is rising in Japan, and not just among the older fans who were raised on the franchise; this may be the first recent Yamato project to break through to those under 30, the hardest demographic to crack. While the synopses of first two episodes read very close to the original, the addition of new supporting characters to the story, especially the female crew members, should draw a much younger audience to YAMATO: 2199. And don't worry, Dessler is still an imperious, blue-skinned, Gamilas Dandy in this version! As for me, personally, I can hardly wait for curtain call at the 'ol Shinjuku Piccadilly theater this April! 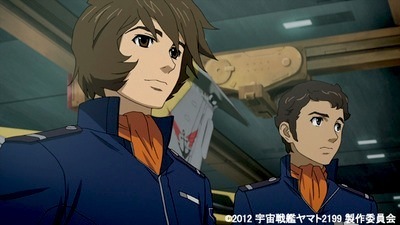 Stay tuned to this blog and the official Star Blazers website for more news and information on SPACE BATTLESHIP YAMATO: 2199 as they develop — and soon, we'll be off to outer space, one more time!